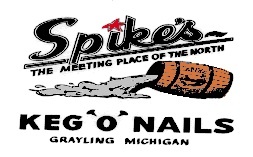 The 2nd Annual LAST BLAST Celebrity Server Night to benefit Crawford County United Way is be held on Wednesday, March 27, 2013 from 5 pm to 8 pm at Spike’s Keg O Nails in Grayling, Michigan. All tips and a portion of the proceeds from all food sold will be donated to your United Way. The funds will be used to help all of our local human services agencies meet their goals and missions in 2013-2104. They will also help with special projects in the community throughout the year. Bring your family, bring your friends. Have some great food and lots of fun while helping a great cause. More information on who will be serving the evening will be provided shortly.